ISLAND GIRL® IS GOOD FOR THE SOLE! Like most plastics, synthetic rubber will eventually become yellowed. However, original color can be restored by use of ISLAND GIRL®'s SEA GLOW™ product, provided that daylight or, even better, direct sunlight is available to cause the blue fluorescing complex in the SEA GLOW™ to be activated. Of course, this product also removes stains and inhibits the growth of mildew. When cleaning dyed leather test a small area first. You may have to use the product with water dilution to reduce its ability to remove the surface dye as well as the stains.We have sold directly and indirectly, many thousands of bottles of SEA GLOW™ for this purpose. It can also be used to prevent yellowing of new shoes and as an adjunt to cusom dying of this type of transparent soles. Ed: Actually we now know that it is excessive heat not the product that affects the glue of the seams. 7. Hi! Thanks a lot for the product. I got SEA GLOW™ to give back the whiteness to the sole of a pair of sneakers and it worked great. I have a sneakers website and posted a review and a SEAGLOW™ ‘How to’ guide; people love it :) It's in Spanish but if you want to take a look a it please go to: http://www.zapapedia.com/cuidado-de-zapas/blanqueo-de-suelas-amarillentas/ . 9. Hi: The SEA GLOW™ product is great, i used it for my sneakers. thanks. I 11. have had great experiences and been very impressed using your products. I primarily use the SEA GLOW™ on the white soles of my shoes and it works wonders. 1. I am satisfied with the ease of application of your products. 2. Instructions are quite clear and easy to follow. 3. I am using your product on only shoes, clear soles of Air Jordans to be exact. They are holding up great. Using with natural sunlight and fluorescent lights to get my results. 4. I have no questions about maintenance, or any other aspect of your products. 5. I have not tried any of your newer products, only the seaglow is needed. I have already ordered 4 bottles and plan on ordering more soon though. 14. Only wish product could be found locally so I could save on shipping, also I am a member of Solecollector.com Your product is always getting high praise on the forums and message boards by myself and other users. I have also recommended SEA GLOW™ to many other users and will continue to do so! I also appreciate your offer for the free shipping by responding to the email, I will be ordering more product as soon as you get back to me! I just wanted to say how excited I am about your combo of SEA GLOW™ together with SG O.xiboost™ . I used them as recommended on some REALLY yellowed (almost brown) soles of some ORIGINAL (15 year old Space Jams . 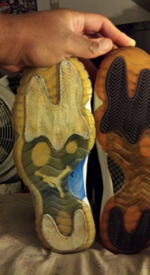 These soles were originally clear but NOT bluish icy as seen on recent Jordan shoes. As you can see the restoration effect is dramatic and this with only 6 applications in wintry New York sunlight.